From Kodak’s corporate offices in Rochester, New York, Chief Marketing Officer Jeffrey Hayzlett and the rest of the team of creative minds at Kodak have remolded the well-known brand for the next generation, shifting emphasis from traditional photoimaging to inkjet printing, digital still image cameras and HD handheld video cameras. Art and Living spoke with the energetic and garrulous Hayzlett about “emotional” technology, innovation, and what it all means for the future of the Kodak Moment. Art and Living: What’s the number one creative challenge for Kodak today? Jeffrey Hayzlett: The number one creative challenge is this: squeeze as many of our innovative products out to the market as we possibly can. I have a saying, “It’s so cold in Rochester, we’ve nothing better to do but sit inside and invent things.” Our team is doing a great job of inventing new products and bringing emotional technology out to the market. So, for us the challenge is deciding what great ideas to eliminate because we can only do so many good things. A+L: How would you say the integration of technological platforms has created new challenges or possibilities? JH: There are so many different ways to communicate, and you have to know where your customers are and where they get their information and how they like to communicate. Then, you have to be there with them and you have to participate. We’re recognized as one of the leading social media-friendly companies out there. In fact, our new pocket video camera was named through a Twitter contest. We went out and got tens of thousands of names submitted to us in a matter of a few days…and we ended up with the Kodak PlaySport, which is our new, waterproof pocket video camera. Social media opens some really cool things. We were one of the first ones to hire a chief blogger, but now we’re hiring a chief listener: somebody who acts like an air traffic controller, listens to the conversations that are going on online, and interacts with them. Some of those are good conversations, and some of them are, quite frankly, bad. They’re criticisms. But that’s what the technological platforms allow us to be able to do. A+L: So, would you say that Kodak is listening better than others? JH: I think all good companies that listen to customer’s needs are exceptional, and I think there are a lot of good companies that do that. We’re just using social media now as another way. It allows us to be quicker and faster than we’ve ever been. It allows us to really open a genuine dialogue. Technology evolves. You have to keep it down to its simplest forms. George Eastman said it best when he started the company. He said, “You push one button and we do the rest.” And so, for him, it was about ease of use of the products, delivering great customer service, and enhancing your bond with the customer. That’s what we try to do. A+L: Can you think of a time the Internet or social media helped improve a design? JH: A runaway bestseller for us over Christmas was our Kodak Zi8. The Zi8 was our second generation of our pocket video camera, and we basically sold out of that product over the Christmas holidays. We put a mic jack on it—a simple mic jack—because we heard people tell us about this need online, and then we talked to people face to face. And we added that, and that became the camera of choice for bloggers and for families wanting to make their own movies…It’s tough in big companies to be able to reach people directly, and that’s why Twitter and Facebook and some of these other social media tools are better than an 800 number. A+L: What excites you about the future? JH: The opportunity to make things easier for consumers and help them stay connected. I mean, people live today in digital families, and they travel more than ever before. They’re not interacting with face time as much as they used to…Our growth in our newer categories—inkjet printers and the pocket video cameras—those kinds of areas are showing us ways in which we can help people share and reconnect. And that’s pretty exciting. A+L: What sorts of new possibilities does HD picture unlock? JH: I think obviously HD means you’re getting the highest quality, but also it’s about the experience. There’s something really special about being able to capture and relive life’s moments—whether in pictures or in video—in HD. I mean, it’s the closest thing to actually being there and seeing the real thing, and so HD allows you that. A+L: How do you improve on that? What’s beyond HD? JH: I think overall, time will tell. But with Kodak, we’ll continue to lead the way in image quality. We have a number of patents in this area; we invented the first digital camera. Kodak’s sweet spot is really in the intersection of material science and digital imaging science. It’s truly a place that we can’t be beat because we started that. We’re going to keep inventing a lot more stuff. A+L: What inspires you and Kodak to create new things? JH: For us, it really gets down to what I call “M3I2.” It’s about make, manage, and move images and information. And that’s what we do, whether it’s in your personal life or your business world. And what inspires us is how we make this emotional technology come to life and have it shared. (Pictured): Hayzlett with the Kodak PlaySport, which offers 1080p HD video recording and features compact and waterproof casing. 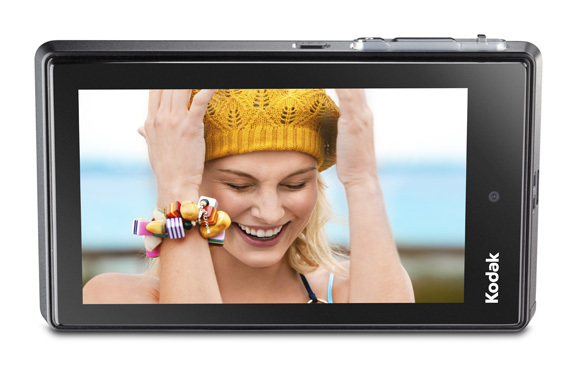 Above, the Kodak Slice touchscreen camera is also a portable photo album that stores thousands of images. Its “Share” button lets users tag photos for simple uploading to Facebook, Kodak Gallery, Flickr, and other sites. Left, the Kodak Pulse digital picture frame comes with an email address and is wireless so friends and family can easily share their pictures directly to the frame. Courtesy of Kodak.